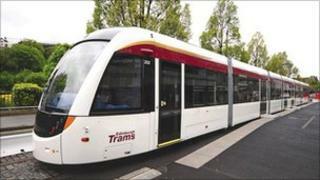 An Edinburgh tram is to take part in a test run through the city centre. Engineers will take a tram for its first trip along Princes Street in the early hours of Thursday. The 45m-long vehicle will move at walking pace along the route and the test will finish by 04:00 to avoid traffic. It is a major landmark for the troubled project, which has suffered huge problems since construction began in May 2008. The frequency of the tram tests will increase after the New Year, with the passenger service due to start next May. Lesley Hinds, Edinburgh City Council's transport convener, said: "We recognise it's been a long road getting here and there's been a lot of frustration but there has been progress more recently and, at long last, it's good to know there's a tram approaching Princes Street. "This is a vital phase of our push to get trams up and running and it's important that the contractors have the time and the space to carry out these tests and checks. "Everyone needs to get used to the trams as they become part of daily life in Edinburgh. "Testing will step up a gear early in the New Year and we'll extend our ongoing safety campaign to ensure all road users are aware of how to share the city safely with trams." A tow truck is on standby to remove any cars that block the tram's path. The city council said it was confident it could meet the revised budget of £776m and the latest target of the line operating by summer 2014. About 130 staff will work on the Edinburgh tram line once it goes live. Earlier this year 1,336 people applied for 57 tram driver and controller positions.